HP spoiler alert! 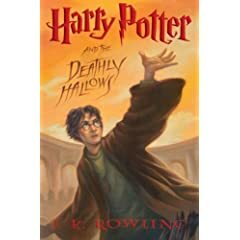 For Harry Potter fans who really can’t wait for just another 1 or 2 days, the seventh and final book in the Harry Potter series of novels by J. K. Rowling., the genuine copy of Harry Potter and the Deathly Hallows has apparently leaked and available for free download from Internet. The first Harry Potter and the Deathly Hallows eBook published and distributed and shared on BitTorrent (and eMule) network is the 759-page American edition. The digital book of 7th Harry Porter novel is actually the captured images of each and every pages of the book by a photographer. Just wonder who had such as patient to shoot 759-page book page-by-page into photos, and pack the pictures into a PDF file which can be flipped and read just like an electronic book. All 36 chapters and a seven-page epilogue purporting to explain the characters’ ultimate fate and destiny. Other than this scanned images, a group known as DSB has also released a typed version of the final installment of Harry Potter series. So you can now enjoy the fun of Harry Potter with these free downloads. Both ebooks can now download via BT P2P network. To search for the torrents, simply visit file sharing sites especially The Pirate Bay, and search for the file names, namely, “Harry Potter – The Deathly Hallows[PDF]GM0” and “Harry Potter and the Deathly Hallows complete version” to download HP7.pdf (photographed image copy) and [DSB]-HP7-(1-10).pdf (typed edition). One possible source of the early release is the mistake made by online retailers Levy Home Entertainment and DeepDiscount.com to ignore the embargo by sending the copies of book to those who pre-ordered on Tuesday, according to Reuters. Beside, New York Times and Baltimore Sun had also published reviews on the book 7 Harry Potter and the Deathly Hallows, which further proved that the leaked downloads are real and not fake, and its early release.